The onset of the modernist movement in western art marked the decline of realism from its place of dominance. In sharp contrast to the realist attempt to imitate the natural world, the moderns saw their art, instead, as an extension of it. But while the modernist movement may have dismissed realism as an “illusionistic” or a “mechanical enterprise,” in The Objective Eye author John Hyman takes a radical new approach to the genre that explores these works as subjects of a much deeper aesthetic interest. Edward Skidelsky writes in a recent review for the New Statesman: “The Objective Eye… scrupulously dissects the various myths and confusions surrounding the concept of depiction, with the aim of rehabilitating realism as ‘one kind of excellence in art. '” Skidelsky applauds Hyman’s work for “championing what sees as the natural, and pre-theoretical stance of artists themselves” and reinvigorating interest in the realist genre in the context of twentieth century criticism. 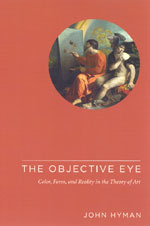 Philosophers, art historians, and students of the arts will find The Objective Eye to be a challenging and absorbing read. . . .
Is the T. S. A. Gambling with Your Safety? After the arrests in Britain involving a plot to bomb several airliners bound for the U.S., the Transportation Security Administration says it will train and deploy screeners in airports to identify terrorists using behavioral cues. But is this really the best way to secure the safety of our airways? Bernard L. Harcourt, a University of Chicago professor of law and the author of Language of the Gun, wrote an intriguing op-ed piece for the New York Times in which he discusses the shortcomings of the statistical methods behind behavioral profiling—a discussion that sets the stage for his forthcoming book Against Predicition: Profiling, Policing, and Punishing in an Actuarial Age. Harcourt’s article makes the case that “investing heavily in seemingly high-tech airport security methods like behavioral profiling” is not a viable solution to securing the nation’s airways and, in fact, “may make air travel less safe on the whole.” Harcourt backs up his claim by citing the “many studies of the ability to detect truth and deception” recently conducted that, he says, have been “largely disappointing.” “A review of the literature,” says Harcourt, “published in 2000 found that in experiments where subjects were trying to detect whether others were telling the . . . 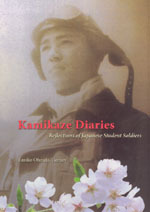 The August 20 edition of the Sunday Telegraph ran a review of Kamikaze Diaries: Reflections of Japanese Student Soldiers—Emiko Ohnuki-Tierney’s presentation of diaries and correspondence left by members of the tokkotai and other Japanese student soldiers who perished during the Second World War. The review further contributes to an ongoing debate about the motivations of these soldiers and the possible similarities between their behavior and that of modern day suicide bombers. Max Hastings writes for the Sunday Telegraph: Emiko Ohnuki-Tierney is successful in convincing the reader that some of those who threw themselves against American and British forces were cultured young men with minds of their own, rather than mindless fanatics.… the book argues that the kamikaze pilots were quite unlike modern Muslim suicide bombers. I disagree. Self-immolation, in 1945 as today, is a tactic of the weak against the strong. Some Japanese military leaders convinced themselves that a heroic human spirit could compensate for hopeless material weakness. They were wrong. The last letters of young Japanese mirror the despair of modern suicide bombers. They simply strove to make the unbearable tolerable.… Emiko Ohnuki-Tierney’s point that many kamikaze were not volunteers, and would have preferred to live, makes their . . .
Revel with a Cause is the first comprehensive history of the satiric humor that flourished during the postwar era—an era that greatly resembles our own politically conservative times. Much like the War on Terror, the Cold War and the fears and anxieties it inspired were used to justify a crackdown on political dissent under the guise of patriotism. But, as Kercher here shows, an impressive range of creative humorists—from incisive cartoonists like Walt Kelly to outragous rebels like Lenny Bruce—responded with defiant wit. These non-conformisats were a crucial voice of criticism and dissent, attacking the supression of civil liberties, Cold War foreign policy, a seething racial crisis, and stifiling social conformity. 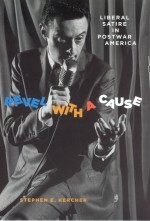 Revel with a Cause will be indispensible to anyone fascinated by the intersection of popular culture and politics—or anyone who simply wants to relish some great American humor. Read the press release. Read an excerpt from the book. . . .
“The Intelligibility of Nature is a very impressive and compelling book about the relationship between instrumentalism and realism in the sciences from 1600 to 1950. 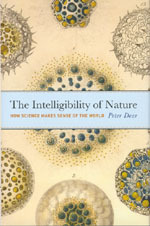 Peter Dear argues for a fascinating reinterpretation of the Scientific Revolution and its aftermath, showing how between the time of Descarts and that of Lavoisier, natural philosophy and practical techniques merged: that process, this book shows, was decisive for the emergence of modern science. 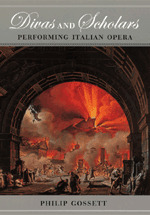 This is a lucid and intelligent history.” —Simon Schaffer, University of Cambridge Read the press release. . . .
Philip Gossett is the world’s leading expert on performing Italian opera. Conductors from Riccardo Muti to Bruno Bartoletti, and singers from Marilyn Horne to Renée Fleming, consult him on how to get the works of composers like Verdi and Rossini right. This magesterial book, the capstone to Gossett’s storied career and the culmination of his decades-long experience, brings colorfully to life the challenges, and occasionally even the scandals, that attend the production of the world’s most favorite operas. Gossett here weds incomparable expertise with his own triumphant experiences producing such celebrated and beloved works as La traviatta, La boheme, and Rigoletto. Part musical history and part back-stage-pass, Divas and Scholars will not only enthrall aficionados of Italian opera but also newcomers seeking a more reliable introduction to it. Read the press release. We also have an excerpt. . . .
Who created the cave art of the Paleolithic era? And why? In some academic quarters, those questions are regarded as more or less settled, and so R. Dale Guthrie’s book, The Nature of Paleolithic Art has been received about as warmly as the Ice Age. However, in her review of the book in the August 18 issue of the Times Higher Education Supplement, Nadia Durrani recognizes that the answers to those basic questions “remain unclear.” Durrani found Guthrie’s book a “fascinating and compulsive read” even as she acknowledges that it is “a controversial book.” (Readers of this blog will have noted our previous postings that have excerpted bits of Guthrie’s book to convey some of the fascinating content of the book. Plus we have all of the preface available online.) What is Guthrie’s thesis? The hot button that has drawn attention—and fire— is that much of the surviving Paleolithic art was not created by shamans for religious purposes or done purely for art’s sake, but was done by “testosterone-laden” young boys. Guthrie’s evidence for so radical a theory? Durrani explains: Guthrie’s thesis draws its main impetus … from the surprisingly limited themes dealt with by the art. Although Palaeolithic art . . . Whether you love them or hate them, critics have helped to influence and, indeed, define the jazz genre. In the August edition of the Literary Review William Palmer argues “that true, improvised jazz has always been a minority taste, and, without critics and promoters like John Hammond and Norman Granz, much of what we prize as real jazz would never have been recorded.” Thus Palmer is quick to rain praise on John Gennari’s Blowin’ Hot and Cool: Jazz and its Critics which chronicles how these writers have affected how we listen to and how we understand jazz. 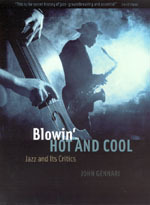 In Blowin’ Hot and Cool, John Gennari provides a definitive history of jazz criticism from the 1920s to the present. The music itself is prominent in his account, as are the musicians—from Louis Armstrong and Duke Ellington to Charlie Parker, John Coltrane, Roscoe Mitchell, and beyond. But the work takes its shape from fascinating stories of the tradition’s key critics—Leonard Feather, Martin Williams, Whitney Balliett, Dan Morgenstern, Gary Giddins, and Stanley Crouch, among many others. Gennari is the first to show the many ways these critics have mediated the relationship between the musicians and the audience—not merely as writers, but in many cases . . . The L. A. Times recently ran a review of Alessandro Scafi’s Mapping Paradise. 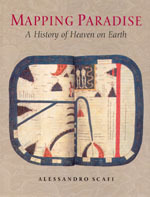 Reviewer David L. Ulin says of Scafi’s book: “Mapping Paradise aspires to be nothing less than a history of earthly paradise … it is an atlas of the imagination, a guide to a landscape that remains just the slightest bit out of reach.” But though paradise may be beyond our grasp, fortunately, Scafi’s book is not. As Ulin insists “Scafi writes with a scholar’s thoroughness. Mapping Paradise is thick with footnotes; at times, the prose can get a little dense. it’s all redeemed by the illustrations, 21 of them in color, that appear on nearly every page.” The first book to show how paradise has been expressed in cartographic form throughout two millennia, Mapping Paradise explores the intellectual conditions that made the medieval mapping of paradise possible and the challenge for mapmakers to make visible a place that was geographically inaccessible and yet real, remote in time and yet still the scene of an essential episode of the history of salvation. A history of the cartography of paradise that journeys from the beginning of Christianity to the present day, Mapping Paradise reveals how the most deeply . 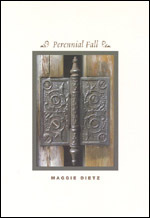 . .
Yesterday’s New York Times Book Review has a review of Maggie Dietz’s new collection of poems Perennial Fall. From the review: When Dietz writes of bowls and hinges, I am reminded of Borges’s distaste for the criticism of T. S. Eliot, who always seemed to be “agreeing with that professor or disagreeing with another.” Borges preferred Emerson, whose writing suggested personal experience of his subjects, as does Dietz’s best work, which is intimate, idiomatic, and thoroughly original. Thus “Bird Bath” which deals with grief, shows the side of the bereaved that is hopeful (“Mute eyes dreaming a sense / of heaven, of what is next.”) and, at the same time, the side that is bereft (“But / everywhere the bald world and cold”). Even the saddest of topics becomes manageable in this poet’s skillful hands. At the heart of this unusually accomplished and affecting first book of poetry is the idea of the hinge—the point of connection, of openings and closings. Maggie Dietz situates herself in the liminal present, bringing together past and future, dream and waking, death and life. Formally exact, rigorous, and tough, these poems accept no easy answers or equations. . . .